The History of Cheltenham | "And sometimes he's so nameless"
It will be twenty five years this September since I moved to Cheltenham, and I have lived here longer than anywhere else. While at heart I remain an East Anglian, I have a great affection for my adopted home, and a pretty good knowledge of its history. A few times in my life I have thought of returning to Suffolk to live; and on one occasion in my early twenties a group of us considered moving to Edinburgh, and even set off on a reconnaissance trip. Going up the M5 the car was involved in a minor collision near Stoke-on-Trent, and we turned back, reaching Birmingham where I insisted on taking the train back to Cheltenham, so shaken was I by my friend’s driving. 😉 So here I have stayed, and I have taken pleasure in learning the history of the town. I must say at this point that my favourite resource for the urban history of Cheltenham is the wonderful blog Cheltonia, which is extremely accessible, readable and fascinating. If you have never seen it then do yourself a favour and go and have a look: I look forward to the irregular updates. It is not Cheltonia which inspired this post however, but the laying of a new carpet and cleaning that accompanied a recent house inspection. It was in the early hours of the night that I found myself looking at a pile of books I had purchased over the years but never had time to more than glance at. The Reverend Frances Close suddenly seemed a more appealing prospect than cleaning the toilet, and I started to read about him. Eventually, somewhere about 5am I picked up Gwen Hart’s History of Cheltenham, and started to read. My first thought was this was perhaps the most tedious book I had ever read; several hours later I still held that opinion, but was far too interested to get up and actually finish what needed doing. I also finished Hart’s book, and I discovered that while extraordinarily densely written in places,and hard going at times even for a historian, it is authoritative and extremely good, amazingly well researched and while not exactly accessible an excellent book on the history of the town. If you have am interest in the history of Cheltenham, this has a huge amount in it, but with a strong emphasis on events at the political, legal and administrative level. Occasionally there are fascinating glimpses of personalities, riots, odd little anecdotes and fun facts, but Hart’s viewpoint is firmly at the big picture level. Much of what I had learned about the history of Cheltenham I now see is a gloss on the detailed work of Hart; it must have taken her many years to writ the book. The readers of my blog probably aren’t as fascinated by 19th century parliamentary elections as I (and these are some of the best bits, with vermin, bricks, name-calling, accusation of bribery and buckets of water thrown at the hustings which may have removed some of the peltings by horse droppings the candidates frequently appear to have sustained.) Still, there are some “big themes” that appear in this book that may interest the casual reader of this blog, and may even inspire some to take a look at Hart’s book so I thought I’d write a little on them today. Firstly, the book cleared up one misconception I held – that Cheltenham was little more than a hamlet until Henry Skillicorne spotted pigeons pecking at mineral deposits and opened the famous spa. In fact Cheltenham appears in the Domesday Book, and was for most of history a town, albeit a very small one, about half a mile long and stretched out on either side of a single street on what is today the High Street. The meadow which lay beyond the Swindon Road north of the town, today St. Paul’s, was common land called “The Marsh”, and equally marshy was The Promenade area down to where the Town Hall is now, and it was best crossed by the planks provided. The River Chelt, more accurately described by most in the past as a brook, ran along the centre of the High Street, and was crossed by planks, stepping stones or wading through the mud. Millers diverted the flow for their waterwheels, and for centuries they disputed the towns demand that the water be allowed to flow along the High Street for a few days a week! I could have misunderstood, but it look that way.Certainly water shortages were a constant problem in the town, and those who lived through the aftermath of the flood of 2007 will sympathize with earlier residents! Another surprise was a railway that ran from Cheltenham to Gloucester before any steam trains existed — apparently it had wooden trucks pulled by horses. I already knew such a railroad existed up Leckhampton hill to the quarries, but had no idea there was a passenger service to Gloucester. The reason for this was probably the terribly state of the roads, which made travel to London arduous in the extreme – 24 hours travel seems to have been the case for most of history, and most travelers journeyed via Gloucester, Cirencester and then west it seems to me from what I could gather. Hart’s book says little about Prestbury, which I know from other sources regarded itself as more important than Cheltenham in the past: that may be little more than village tradition. Winchcombe certainly was — the reasons for the decline are laid out clearly in Hart, as is the failure of another town that hoped to rival Cheltenham, Pittville. Indeed Pittville was built as a private estate development” according to Hart precisely as a second and better town in the valley, and Joseph Pitt and the Pittvillians avoided paying rates for a very long time — as surprisingly did the inhabitants of Bayshill, again a private development which saw itself as not part of Cheltenham. Of course Bayshill and Pittville were not built until after the Spa made Cheltenham fashionable — and one weakness of the book is it is a little hard to trace the precise development of the streets from it — Cheltonia is much better for this purpose. The history of the manor of Cheltenham is complex, but in short it was a royal manor, then passed to a Convent and administered for their benefit, and after this long history of absentee landlords was purchased with the Dissolution of the monasteries and passed in to the hands of the Norwood family, the Duttons, and then the Sherbornes of Berkeley Castle. The Sherbornes come over as tremendous characters, given not just to fox hunting, but with all kinds of sporting events. Their political Liberalism set the tone for the town, which was dominated by Liberals and returned Liberal MP’s for many decades. When one of the Berkeleys was finally defeated and they withdrew from politics, the Conservatives had a two decade spell of victories towards the end of the 19th century, and this was undoubtedly helped by the purchase of the manor by the Agg-Gardner family and their hard work in Conservative politics, and by the Evangelical clergy of the Church of England, with their morbid fear of the Oxford Movement, and strong Tory politics. Hart traces the political history of the town in loving detail, and given the tumultuous and often riotous nature of local elections, it is a great read; one incident when during an election a young Conservative shot dead a Liberal campaigner at point blank range on the High St was rather surprising – the murder got ten years for manslaughter, but apparently their was general sympathy because of the heated nature of all Cheltenham elections! The history of Cheltenham in the Civil War is also more complex than I suspected, with several skirmishes taking place in the area related to the Siege of Gloucester. The Lord of the Manor Tom Dutton comes over as a very sympathetic bloke: originally a moderate member of Parliament, who joined the Royalists when war broke out, then after the War became a dear friend of Oliver Cromwell. I had never heard of him till I read Hart. After the Civil War there was a different problem – Cheltenham and Gloucester had fine soil for growing tobacco, and had plantations that were damaging the economic prospects of the Virginia colony. Parliament decreed the crops must be destroyed and sent troops, and were met by large bodies of angry tobacco farmers who drove them off. Eventually Parliament succeeded in destroying the crop, and this was one of the final blows to Winchcombe – Cheltenham survived and prospered because of the market however. Still it was not until the opening of the Spa’s in response for the Georgian craze for drinking mineral waters that Cheltenham prospered. Apparently the waters were known for their purgative powers, which I think means they made you run to the loo. Still they were immensely fashionable, and Henry Skillicorne set the fashion for tree lined walks, scenic spas, and grand balls. I think this period of Cheltenham’s history, when the young King George III paid an important visit is so well known I need not dwell upon it. By the time of the Napoleonic Wars Cheltenham was a very fashionable place to be, and when the Spa’s declined in importance, the creation of Cheltenham College, Cheltenham Ladies College and the polite and genteel nature of the place attracted many of the snobbiest elements of Society. It also attracted vagrants, the poor and dispossessed – and nine guards were placed on the routes in to town to work day and night to stop the destitute without hope of employment moving to Cheltenham and become a burden upon the Poor Rates. This was not unusual, as those who were unable to support themselves were expected to stay in their own parishes, and many slipped in anyway I expect, and some perhaps prospered. Hart’s emphasis is mainly on civic administration, and the Reverend Frances Close, a famous 19th century Evangelical preacher is a central figure in the history of the town. I would write more on him did I not intend to one day blog on this most –er, words fail me actually — interesting fellow. Whatever the disagreements I may have with his very hardline Evangelical approach, he certainly worked tirelessly for the benefit of the town, and did a huge amount to help it. Tennyson, who resided for some years in the town despised him, and while the Liberals dominated the politics of the town, Low Church Evangelical Theology set the moral tone and acceptable manners, to the detriment of the horse-races (stopped by Close), Sunday trains (stopped by Close), the theatres (closed by Close) and the Catholic shop owners and residents, whose properties were damaged by riots inspired by Close’s anti-Catholic preaching! I hasten to add the above were NOT the benefits he brought to the town, which were in terms of municipal development, the opening of colleges, and the building of many churches for the poor, at a time when most of Cheltenham’s churches apart from the ancient parish churches charged on the door if you had not subscribed t its building and catered only for the wealthy! Hart describes in great detail the three main bodies charged with civic governance – the Commissioners, and unelected and widely despised body drawn mainly from ex-service folk and the elite, who tried to arrange adequate lighting, water, sewage and policing (though often delaying for decades: perhaps because many of them were shareholders in the private Gas, Water and Sewage companies which supplied the wealthier part of town). Largely Conservative, they were often in conflict with the Vestry, a body with similar duties for the parish of Cheltenham, and the Magistrates. All three constantly clashed over civic administration, with the magistrates at one point simply refusing to convict any of the by-laws promulgated by the Commissioners. The Commissioners steadfastly protected the rights of the wealthy, and every attempt at democratic reform faltered on their insistence on plural voting, where those who paid the most in rates got more votes (up to twelve) than those who paid less, and the poorest received no votes at all. The Vestry and Commissioners together did manage to eventually force the Trustees of Corpus Christi to pay their dues for land held to the grammar school founded by Richard Pate centuries before, only to suffer from a Headmaster who refused to teach non-paying scholars anything but Latin and Greek. The problem was resolved, and the school, today Pates, went on to excellence, but it was a long struggle, which Hart relates in detail. 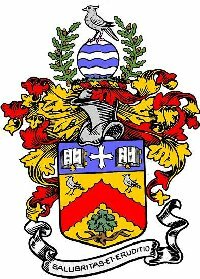 The arms of Cheltenham granted after the incorporation of the borough in 1876. It is possible to trace the development of the town from Hart, and I was surprised at how long it took for parts to be built; some things have changed little, the Lower High Street area being rather run down even in the nineteenth century. She concludes her main story in 1876 with the struggle to incorporate the Borough, to provide a Mayor and town council — even then plural voting game most votes to those with the most property. With the decline of the Spa’s the generosity of James Agg-Gardner led to the creation of Pittville Park, and the municipality bought more land to add to it; at the other end of the town the old spa was demolished by Lloyds Bank, barring the rotunda, but Montpelier Gardens were bought and set aside for public usage. Their is a splendid description of the struggle to create a public library: it was considered by opponents highly dangerous to educate the poor, unless one had some control over what they were reading, perhaps reflecting the minority influence of Cheltenham’s Radicals, who were their forebears of today’s Labour party, and strongly concerned with worker’s education, political reform and socialism, and who held meetings at the Mechanics Institute in Albion Street, and occasionally faced persecution. Radicals came from all classes of society however, and they had a weekly newspaper, to balance the Liberal and Conservative papers – all three sound positively scurrilous even by today’s low standards. It would be wonderful if some of those 19th century papers could be rescued from dusty microfiche and be made available online – has any History Society considered this? Hart’s book is NOT a popular treatment, but a detailed and well researched, sometimes dry read. Nonetheless it contains a great amount of interest, in covering a thousand years of Cheltenham’s history. I would perhaps not recommend it to the casual reader, but if you are interested in depth in the history of the town, you really should pick a copy up. Hart, G (1965) A History of Cheltenham, Alan Sutton, Gloucester. This entry was posted in History, Reviews and Past Events, Uninteresting to others whitterings about my life. Bookmark the permalink. Will re post to people who I know will enjoy it too. Hey Matt, if anything in particular about Cheltenham’s history interests (like certain streets or things) you let me know and I’ll look it up. I have a few more books on the town laying around I picked up over the years second hand. Cheers! I want to see a rough-drawn map of 1220 Cheltenham and where you would put the covenant.